Barcadia has recently opened in bustling Oxford Street. It offers good wine, fine dining and a cosy setting. The food menu is separated into two main sections Small Shares and Large Shares – judging by the price of the large plates I assume they are to be shared (prices from $22-$35). I love the idea of share plates but these dishes were not easily shareable. 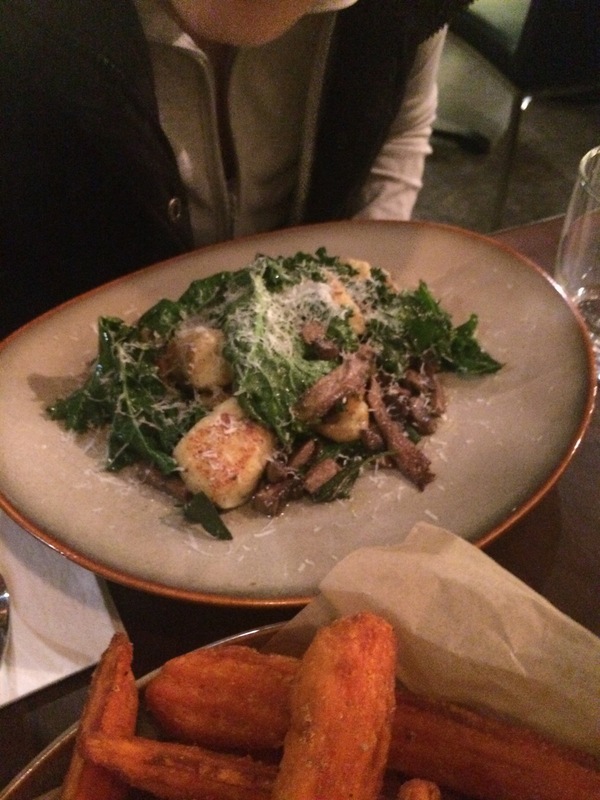 We weren’t really in the mood for sharing so the only meal we had off the Large Shares menu was the Pan-Fried House Gnocchi (Guanciale, lemon sage and truffle butter) $22. Which was tasty if anything a little bit oily and bland in flavour. The second meal that arrived (please note they did not arrive together) was the Roasted Baby Seasonal Veg and Wheat Salad (with Baja Sauce) $16. 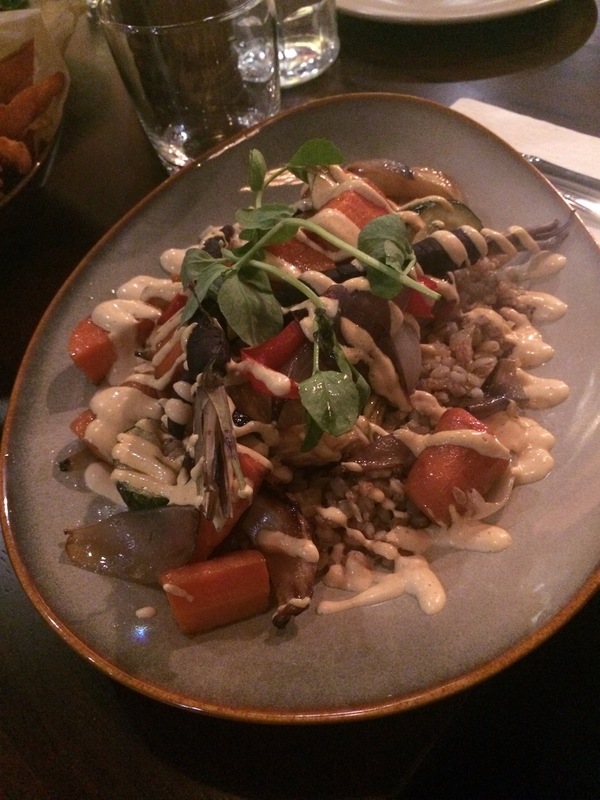 This dish was reasonably priced and the vegetables were cooked nicely. Good value for what you got. 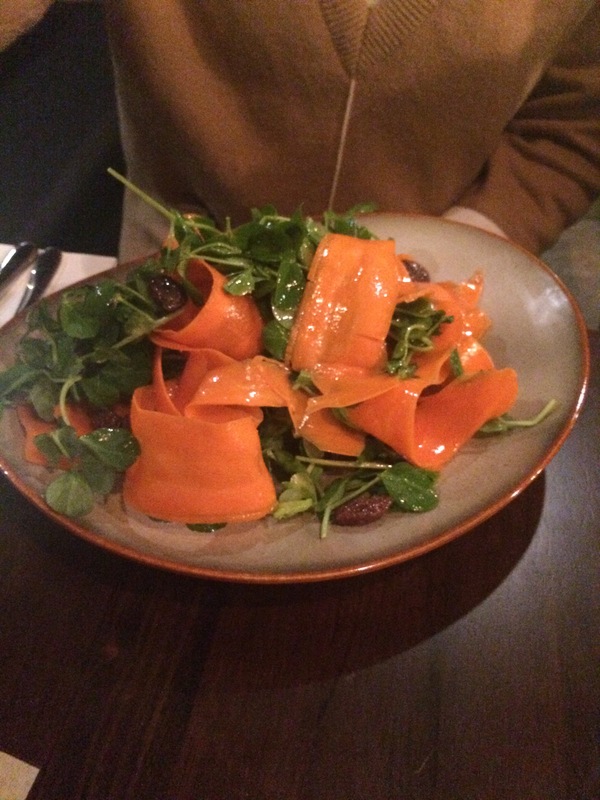 We weren’t intentionally ordering from only the salad menu I promise but our third dish was the Winter Root Salad (with team raisins and Manuka honey) $12. Unfortunately, the only real root vegetables were carrots and watercress… and the dressing was not as tasty as anticipated. 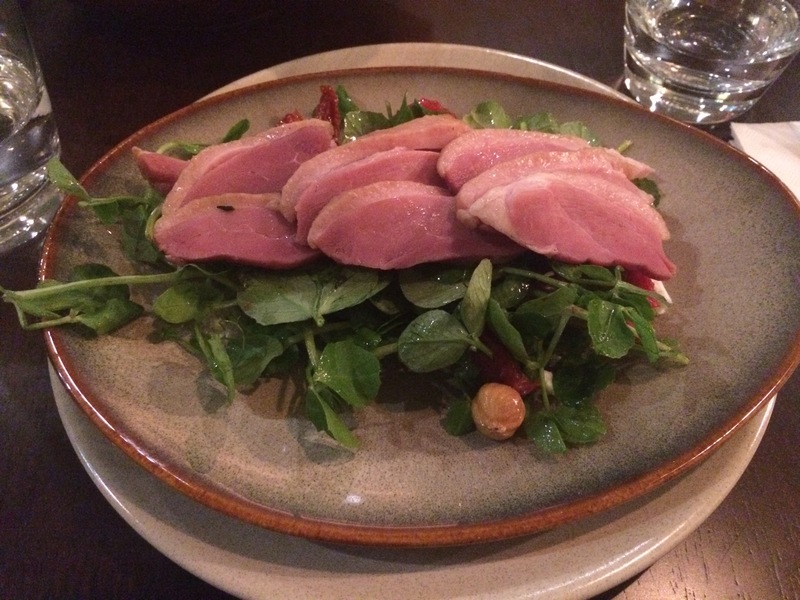 I decided to be adeventurous and try the House Smoked Duck Ham (on hazelnut cress and pickled concasse salad) $23. I had never tried Duck Ham before and was pleasantly surprised. Initially, I was put off by the colour of the duck but once remembering it was ham I was sorted. It was cooked nicely and the hazelnut and cress salad was a good accompaniment. 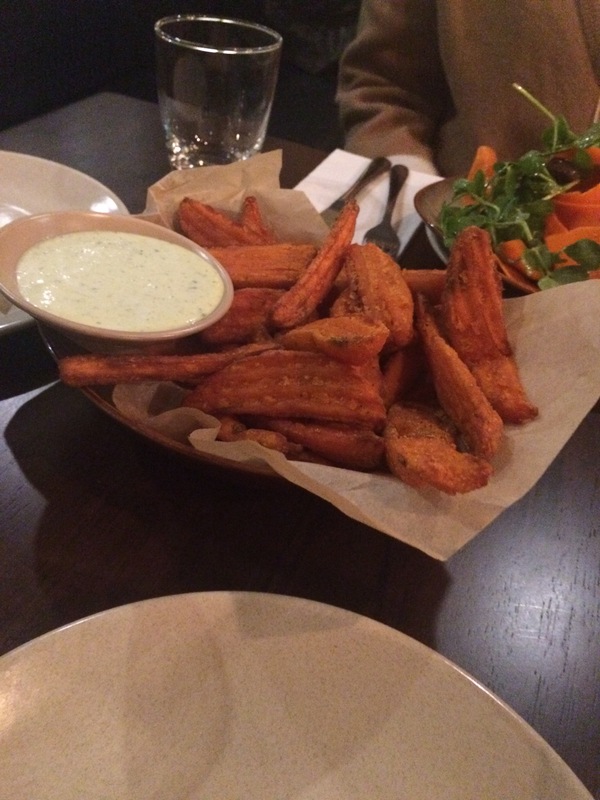 I have to say the best dish we ordered today was the Sweet Potato Wedges with tarragon aioli $10. They were large chunky, crispy and well seasoned. Barcadia’s cocktail and bourbon menu looks exciting and inventive. It is the perfect location for a couple of quiet drinks – such a shame that we weren’t drinking so didn’t try any of it! Barcadia is about halfway down Oxford Street, opposite the large park. There is some parking out the back but it is first in best dressed. The city cat is close by and plenty of buses. The venue itself has large open indoor and outdoor areas. As it was the middle of winter outside was empty but the long bar tables would be great of an evening in summer. Inside the large tables continue as well as booth seats. Unfortunately, we were seated near the door on a particularly breezy night. I try not to gripe about service and I give people a pretty lenient rein but service really let my experience down at Barcadia. Our waitress was unpersonable and shy practically running away from our gazes for service. The food took too long to arrive and came all at different times. We went on a Wednesday night, I wouldn’t like to have been dining on a busier evening. The Verdict: It seems like Barcadia knows how to do the basics but they are trying to hard and over complicating the flavours. This place has potential they just need to tidy up the menu and service. I won’t be rushing back but I will be interested to hear how they go. Overall: 5/10.